It is my birthday. Again. Funny how that happens. Which means this post is officially one year late! I have a confession to make. For me, this one was all about the gifts. O, those gifts. They came by the dozens from friends near and far. Each and every perfect one made me well up with tears. Birthday morning dawned clear and sunny and I woke up to a ringing doorbell and a yard full of birthday blessings. Two amazing friends had gone on a stealth mission and beat the birthday drums on Facebook. The result? 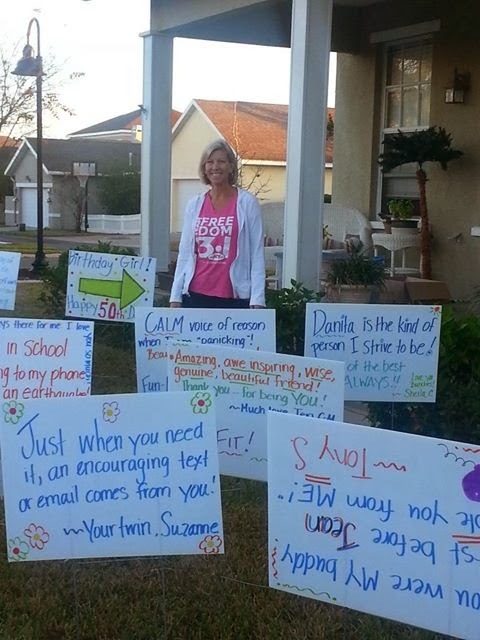 A yard covered with giant signs from my friends. Seriously. I read and cried and read and wiped my eyes with the sleeve of my robe. It felt like Sally Fields at the Oscars that year, “You like me, you really like me…” Words of love that brought tears of joy. Later that day, a box from my sister arrived with 50 little gifts, each one covered with memories and words of love. I can’t tell you much about the presents, but oh the words. The Words! Best. Gift. Ever. Thank you, dear ones. You see, we never really know what effect we are having on the folks around us. We go through life doing what we do, living and loving and carpooling and doing laundry; making phone calls and dinner, chairing committees and doing our jobs. There is no report card with a gold star. No ‘satisfactory progress’ at the end of our quarter. But these ‘words from friends’ that littered my yard were like glittery stars and student of the month all wrapped up in a shiny bow. A little ‘you go girl’ whispered in my ear at just the right moment. Maybe this Christmas, it’s ok to make it about the gifts. Just a different kind of gift. What if we leave the mall and close the online shopping cart and sit down to write an old fashioned letter to a friend or two ( or mom or dad or husband or child or sibling). Maybe the best thing we could give those we love is the encouragement they need to keep on doing what they are doing day after day. Just words? Yes, WORDS. O, how we need each other’s words in our lives. Long after the candle is burnt and the gift card is spent and the shirt has gone to Goodwill, words will be the things that last, tucked away in a drawer to read again and again. Let’s be generous with our words this year. Pretty stationery, funny card, or giant yard sign, it really doesn’t matter. The point is simply to tell those we love that we do. While they are still around to hear it. I remember ___________ and it meant so much to me that you __________. Because of you, I am a better ___________. You have a gift for _______________. When I think of you, I think of ___________ . May you continue to feel God's love, peace, strength and Light surrounding you and flowing through you. Love and hugs and have a wonderful Christmas holiday season too. Soo glad you were blessed like that! Love this post. Yes, we are on the same page. WORDS. They last for-ever!! Love that GOD showered you with encouraging words and showed you the impact of the words you have spoken over and into so many lives through these precious friends and their gifts!! love you girl - and happy birthday!! !